Der Artikel Journey: Live At The Cow Palace (180g) wurde in den Warenkorb gelegt. Journey’s transition from prog rock pioneers to commercial FM stalwarts alongside Foreigner and Boston was about to take shape with a revised line-up that would feature Robert Fleischman and then Steve Perry. Their appearance at Cow Palace in Daly City, SF on New Year’s Eve would be their last performance as the familiar quartet that had arisen from Santana and Frumious Bandersnatch. Ironically, Journey and Santana would compliment each other tonight on the same bill with Santana closing the show and welcoming 1978. 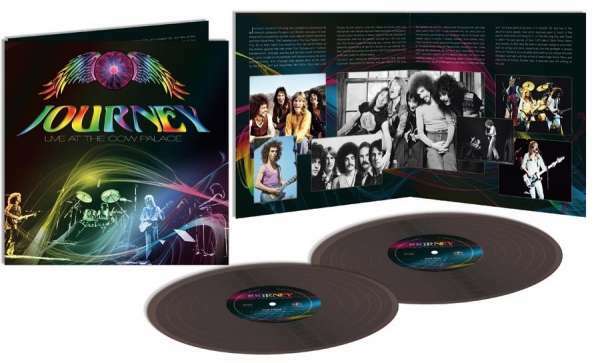 Although only two years into their professional career, Journey’s performance here seems slightly sentimental in harking back to their three albums, in particular their 1975 debut and it’s follow-up Look Into The Future, both of which feature strongly here. Live On Vinyl proudly presents the entire KSAN-FM broadcast of Journey’s stunning live performance from Cow Palace, Daly City, San Francisco on New Years Eve 1977. Professionally re-mastered with background liners and rare archival photos.